Name occurring in the so-called table of generations, Gen. x. 4 (comp. I Chron. i. 7) and in Ezek. xxvii. 7. In Gen. x. 4 Elishah is one of the four sons of Javan; therefore a people or a country related to the Ionians. In Ezek. xxvii. 7 the name designates a region in the Mediterranean Sea, whence Tyre is reported to have imported purple. Various explanations and identifications have been proposed. Halévy ("R. E. J." xiii. 14) and others regard it as the Peloponnesus, which in fact was celebrated for its purple murex, the name being an echo of "Elis," if not of "Hellas." An old tradition (Josephus, "Ant." i. 6, § 2) regards Elishah as Æolis (see Yer. Targ. to Gen. x. 4). H. Derenbourg ("Nouveaux Mélanges Orientaux," pp. 236 et seq. ; English transl. 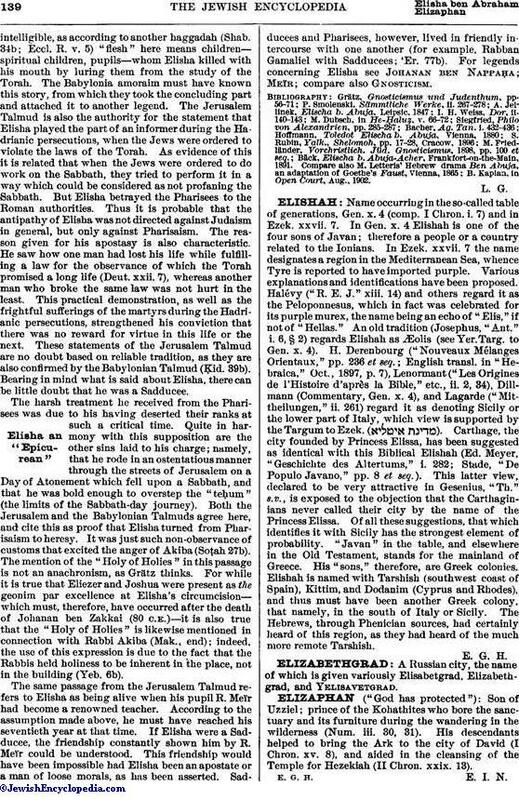 in "Hebraica," Oct., 1897, p. 7), Lenormant ("Les Origines de l'Histoire d'après la Bible," etc., ii. 2, 34), Dillmann (Commentary, Gen. x. 4), and Lagarde ("Mittheilungen," ii. 261) regard it as denoting Sicily or the lower part of Italy, which view is supported by the Targum to Ezek. ( ). Carthage, the city founded by Princess Elissa, has been suggested as identical with this Biblical Elishah (Ed. Meyer, "Geschichte des Altertums," i. 282; Stade, "De Populo Javano," pp. 8 et seq.). This latter view, declared to be very attractive in Gesenius, "Th." s.v., is exposed to the objection that the Carthaginians never called their city by the name of the Princess Elissa. Of all these suggestions, that which identifies it with Sicily has the strongest element of probability. "Javan" in the table, and elsewhere in the Old Testament, stands for the mainland of Greece. His "sons," therefore, are Greek colonies. Elishah is named with Tarshish (southwest coast of Spain), Kittim, and Dodanim (Cyprus and Rhodes), and thus must have been another Greek colony, that namely, in the south of Italy or Sicily. The Hebrews, through Phenician sources, had certainly heard of this region, as they had heard of the much more remote Tarshish.